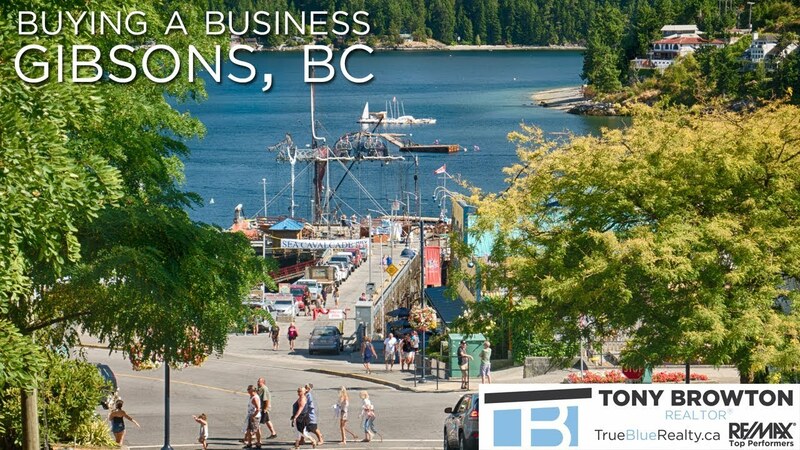 I can’t imagine a better place to own a business than on BC’s spectacular Sunshine Coast. Today we’re going to tour Gibsons and I’ll show you why this is a great community in which to live, work, and invest. Gibsons is the southernmost community on the Sunshine Coast and is home to roughly 4,600 people. It also services a large rural region comprised of an additional 13,000 residents. Despite its modest size, Gibsons boasts big city amenities like fibre-optic high speed internet, public transit, and has even played host to large film and television productions. Gibsons is divided into two regions – Lower Gibsons and Upper Gibsons. Lower Gibsons – or the Landing as it’s sometimes referred – is on the water and is comprised of chic, trendy restaurants, galleries, and shops. This is also where you’ll find Gibsons’ Harbour. The harbour is home to commercial fishing boats from late fall to early spring. During the summer months, tourists and pleasure vessels flock to the area. The Landing is the first stop many tourists make when they visit the Sunshine Coast and as such, commercial space is always in high demand. Lower Gibsons is also where the town’s municipal office is located. Whether you have questions about a business license or zoning requirements or special permits, this should be your first stop. Upper Gibsons is the town’s commercial and industrial hub. Here you’ll find shopping complexes, national chain stores, and medical and emergency services. It’s home to the high school and elementary school. There’s also a light industrial park that’s home to businesses like boat builders, auto repair, and equipment rental. Whether you’re looking to own a stylish boutique, an automotive body shop, or anything in between, the community is eager to embrace and support your new venture. Gibsons has an active chamber of commerce that boasts 220 member businesses. From a business perspective, investing in Gibsons makes a lot of sense. But when you factor in community and lifestyle, making Gibsons your home is an absolute no brainer. In 2009, the United Nations-endorsed LivCom award was presented to Gibsons for being the world’s best town. In 2005, Gibsons pure, unchlorinated water was named the best in the world. You’re minutes away from world-class hiking, SCUBA diving, mountain biking, and almost any other outdoor activity you can think of. Gibsons has a low crime rate; warm, sunny summers; and some of the mildest winters in Canada. Despite all that, Gibsons’ housing prices are still relative bargains, especially when compared to the Lower Mainland. If you’re still not convinced, just have a look around. I’ve traveled all over the world and BC’s Sunshine Coast is the most beautiful place I’ve ever been. Whether you arrive on the ferry, a sailboat, or via a future fixed link, Gibsons is the gateway to the Sunshine Coast and has positioned itself as an economic hub and driver of growth for the entire region.